Vibosoft introduces 3-in-1 Transfer Tool to Export All Files from iPhone/iPad/iPod to PC. This iPhone/iPad/iPod to Computer Transfer is a smart tool for iOS users to synchronize data on iDevices to the computer. It matches iPhone, iPad and iPod contents to iTunes and seamlessly being able to export the files to PC. The latest version makes it possible to export data from iDevices to iTunes library with ease. Besides, users can import them to the iTunes as well. Dedicated to the career of data backup and recovery of iOS and Android, Vibosoft has been devoted to provide consumers with the perfect products and services worldwide. Today, Vibosoft announces the release of the best mobile tool – Vibosoft iPhone/iPad/iPod to Computer Transfer. “This iPhone/iPad/iPod to Computer Transfer is a smart tool for iOS users to synchronize data on iDevices to the computer. It matches iPhone, iPad and iPod contents to iTunes and seamlessly being able to export the files to PC. The latest version makes it possible to export data from iDevices to iTunes library with ease. Besides, users can import them to the iTunes as well.” said Michael, Product Manager of Vibosoft. It perfectly supports all iOS recognizable files like music, movie, photos, books, audiobooks, podcasts, camera roll, podcast, TV show, playlist, contacts, messages, notes, Safari, voice memo and so on. 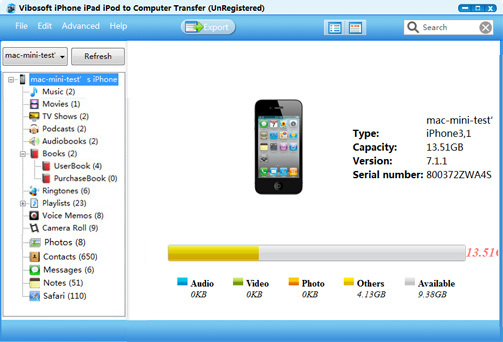 This Transfer Tool allows users to back up and restore all of the iPhone, iPad or iPod Touch content. With advanced settings, users can back up folders directly. It also empowers users to use iPhone, iPad or iPod as a portable hard drive. It is fully compatible with all iOS devices including iPhone 6 Plus /6, iPhone 5S/5C/5, iPhone 4s/4, iPad 4/2/1, iPad Air 2/Air, iPad mini 3/2/mini, iPod touch, etc. Vibosoft studio has successively introduced both Windows and Mac versions of Vibosoft iPhone/iPad/iPod to Computer Transfer. Either version is available for free download and trial. Windows version is $35.95 and Mac version is only $39.95. Vibosoft Inc. was established in 2009 and located in Shenzhen, China. Dedicated to the career of data backup and recovery of iOS and Android, Vibosoft has been devoted to provide consumers with the perfect products and services worldwide for over 5 years. Millions of people spreading over 180 countries are now using Vibosoft’s products. For more information, please visit https://www.vibosoft.com.